This time I want to share this. 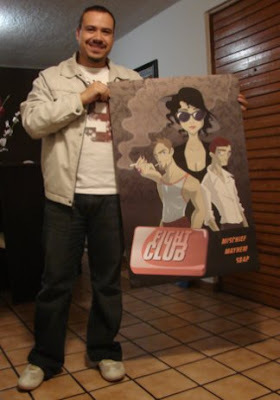 That's me, in case you wonder, showing a beautifully printed poster of my illustration of Fight Club. This is the medium size (60 x 90 cm, 23 x 35 inches) and looks really impressive! The happy owner is my cousin Fer, I'll try to update this post with a picture of him once he frames and hangs the poster. Hello! 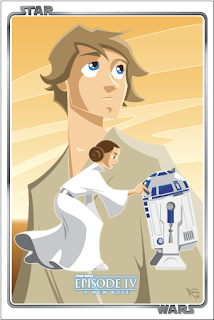 After finishing my 6 poster marathon about the Star Wars saga, I had no idea what movie should I illustrate now. Some people have told me that I must draw The Godfather, or Trainspotting, or some other great movies. In the meantime, I've been sketching some ideas, but one of my favorite sketches was this Batman, based on the Christopher Nolan's movies. Some of the best superhero movies ever done, being The Dark Knight one of the best movies of all time. I liked it so much that I decided to make it a poster to go along the one I did of the Joker. Both look great side by side! I've already printed some posters and later I'll post some photographs of them, so you can see quality and color. They look great! Hi! Today I'll share a cartoon I made for Elizabeth Rivero's blog about a grenade attack last monday, during the mexican independence celebration in Morelia, Michoacan. It was a disastrous and terrible act of terrorism, something us mexicans are not used to. 7 people died and several more were injured! There's now an atmosphere of uncertainity among the mexican population and we feel like we're being held hostages in our own country. So I decided to make a caricature about that and my wife and fellow blogger added it to her blog. If you're interested in reading an insightful opinion on the attack, check her post. FINALLY!!! All six Star Wars posters are finished! The last one is definitely one of my favorites. 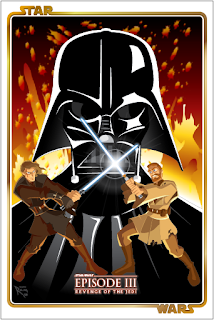 I wanted to mirror the Episode III illustration, but contrasting it with basically no action, just Vader and Luke staring at one another, a duel of will more than a duel of sabers. I really liked the general black and blue theme, with the Death Star window and stars in the background. 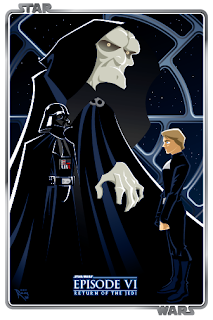 Emperor Palpatine was a bit of a challenge, since I wanted a stylish version of him but with no loss of his facial scars. His eyes, hand and the flow of his cape look really cool! So the Star Wars series of posters is done and if you want a printed version of them, you can send me a mail. The cost of each 120 x 90 cm. poster is $55 USD (plus shipping) but if you buy all 6, I'll give you a $30 USD discount! You can also buy the 60 x 90 cm. versions for $40 USD each, plus shipping. Here's the fifth poster of the Star Wars Saga. Sorry it took a bit more to finish it, but last week was a bit rough. Anyway, this illustration is one of the darkest I've done in tone and concept. I know there are more... iconic scenes from The Empire Strikes Back, but the image of Han Solo frozen in carbonite is burned in my head since I was a child. That's why I wanted to use it. I really liked how it looks in the end, since it was difficult to find the right colors to use and the right contrast. On the other hand, I like how I'm mirroring Anakin's visual arc of the first three illustrations in Luke's visual arc of the last three. We can see here a weary, yet immature Luke. I'm looking forward to draw him as the full-fledged jedi he is Return of the Jedi! If you don't know yet, you can purchase poster-size versions of this and the other illustrations I've done. Contact me if you want to buy them! The weekend finally arrives! And with it, another illustration. This time, it's the fourth poster from de Star Wars saga, based on the original film now known as Episode IV - A new hope. After an intense and dynamic composition for Episode III, I went for a more innocent – almost naive – approach for this one. After all, the theme of this movie is more light-hearted. I had another composition in mind for this poster, but I changed my mind after seeing some pictures of young Luke Skywalker looking over the Tatooine landscape, that inspired me to illustrate him as the background character with that eager, hopeful stare. It looks really cool in my opinion! In other news, I printed this week a test to check quality and color of all illustrations so far, and they look gorgeous! Everyone who has seen them thought they're awesome and even some have been asking for printed versions of their favorites. 1 printed poster (big size: 90 x 120 cms / 35 x 47 inches): $55 USD plus shipping. 1 printed poster (medium size: 60 x 90 cms / 23 x 35 inches): $40 USD plus shipping. One of the most powerful movies of the saga, — although many don't like the prequel trilogy— and also one of my favorites (it has its flaws, I admit that, but I enjoyed it anyway). The duel of the fates, between Anakin and Obi-Wan, the downfall of the Republic, the rise of the Empire and above all, the rise of Lord Darth Vader, it all happens here. What a fan fest! 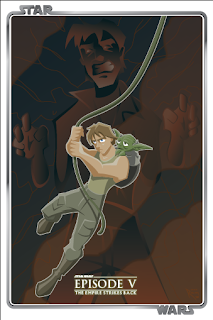 I really enjoyed making this illustration, especially Anakin's face, it's so intense and furious! Vader also looks amazing in my opinion. I was a bit afraid of applying the cartoony style I'm using on him, but it ended up looking much better than I expected. I hope you like it. Please, leave a comment and tell me what you think about it. Of course, the printed version is for sale, so If you want it contact me. Send me an Email now to get your posters! Today's my birthday! So to celebrate this moment, I'm posting two illustrations instead of just one. Both are part of my At the Movies series and also part of the Star Wars saga. A friend of my wife (hello Chong!) asked me for printed versions of the six Star Wars movies illustrated, so that motivated me to draw them. People who know me, know that I'm a fan of the Saga since my childhood, so there is some extra affection on this drawings. 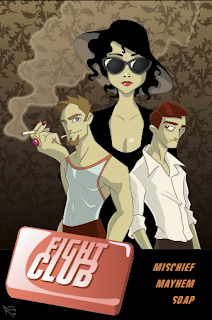 I changed the style a bit to resemble a pulp movie style. I hope you like them! Right know I'm working on the third episode, but I'm hoping to have all six by the end of August. As you know, if you would like some prints, you can contact me. First time I heard about Aslan, was on a song by spanish songwriter Marcos Vidal. 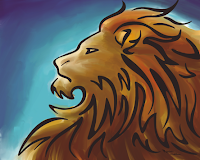 Its lyrics describe the character as both a fierce warrior and a faithful, tender friend. Vidal calls him "the lion of Judah's tribe" and with a lot of reason! It was years later that I learned this song was talking about the lion character in C. S. Lewis' The Chronicles of Narnia. This series of books, although childish, are very beautiful and insightful. That's why I felt inspired in painting a big portrait (55 by 40 inches) in digital oil for my living room. I haven't had the chance to print and frame it, but I assure you it will look amazing! P.S. I decided to include this one while I'm working on the next batch of posters from the At the Movies series. The next six posters will be based on the Star Wars saga! By the way, thanks a lot to all and everyone who has seen my work. Many of you have said such great things about it, pushing me to continue illustrating! Bless you all! Did you knew that the late Heath Ledger acted on The Dark Knight? Because honestly, I never saw him in the movie. As writer/director/fanboy Kevin Smith said, the actor completely disapeared behind the Joker character. Every line of dialog, every gesture, everything from this character just left me breathless! Impressive! And, although I considered not to include any comic-based film on my At the Movies series, I thought this one deserved a chance. 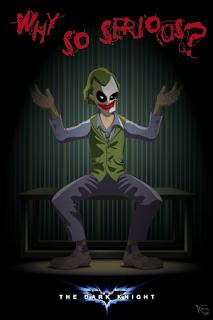 So here's my latest artwork, based on one of the most cynical scenes of the Joker, applauding in jail at Gordon's promotion. This is also a modest homage to one of Hollywood's finest actors in one of the most memorable performances of the decade. In case you want a printed poster of this illustration, just let me know it and I'll even give you a desktop wallpaper for free! In the meantime, make your comments and tell me your thoughts on this illustration. The first time I saw this movie, was with a couple of friends from College. We left the movie theater in shock! A great reflexion of today's consumer-driven society. Fight Club was an incredibly well done movie. One of the things that caught my eye the most was that pseudo-love triangle between Tyler Durden, Marla Singer and the Narrator. Or, to put it in Edward Norton's memorable description: Marla... the little scratch on the roof of your mouth that would heal if only you could stop tonguing it, but you can't. That scene inspired me to do this illustration, wich I enjoyed drawing. So what are your thoughts of it? Please contact me if you're interested in a printed poster! 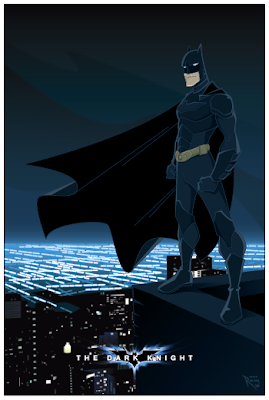 So, this was my first illustration from the At the Movies series. Definitely one of my favorites films. 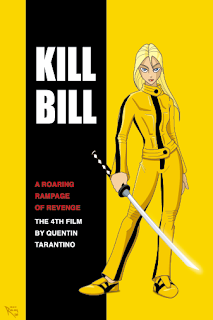 Obviously, this piece of art references the Vol.1, If I come with an interesting concept, I'll do a poster from the Vol.2 – perhaps Beatrix Kiddo vs. Elle Driver, or even vs. Bill himself! I don't know yet, for now, I have this one that I like a lot! How do you like it? Would you like to have this hanging on your favorite wall? Believe me it will look impressive! Contact me if you're interested in a printed poster. Hi, welcome to the Art of Ram blog, where I'll be exposing some of my artwork, paintings and illustration. I'm starting this blog with a series of illustrations called "At the movies". The concept behind this series is to create a stylized movie poster of some of the films that have caught my eye through the years. Please feel free to comment what you think of each illustration. I've been thinking also of selling posters of my work so, if you think it's worth it (or even want to buy one!) then let me know.